Some significant news broke today on Twitter — according to EVO writer Chris Harris & Lexus Europe, Lexus driver Akira Iida posted a 7:14 lap time of the Nürburgring Nordschleife in a LFA Nürburgring Edition — good enough for either the fourth or fifth all-time fastest lap on the famed German track in a production vehicle (the exact time has yet to be announced). Even more impressive, regardless of milliseconds, this is the fastest lap ever by a mainstream manufacturer. Now just imagine shaving :22 off this lap — absolutely amazing achievement. 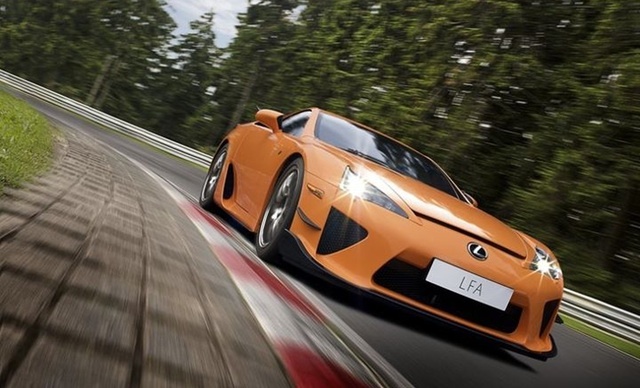 Mr. Iida- San has set this record on the full Nordschleife during a customer meeting with LF-A buyers held on wednesday 01.09. and thursday 02.09.2011. The news was brought to Mr. Tanahashi – San ( chief engineer LF-A project ) during the wednesday evening diner and he was delighted but said they had to wait till the record time was approved officially. The video with driver Iida-San is indeed part of the circuit as every LF-A customer was able to join one of the drivers for a quick lap on the track. Therefore it was during this time not possible to do a full lap as the cars had to go thru the pit. My best guess is that about 250 meters track was closed to organize this pit lane stop action. During the record setting the full track was open. Zeemax88: Dodge Viper ACR 7m12.1s YES Yes Record reclaimed in Sept 2011.